What's new in the Network? October Holidays! Metric Day is October 10th (10/10), and Keith Ostfeld from the Children’s Museum of Houston suggested celebrating the billion day on 10/9.There are a number of NISE Net resources related to scale and the size of a nanometer, including: the At the Nanoscale exhibit, the Viz Lab scale ladder, the How Small Is Nano book and scale ladders, and the Is That Robot Real? book. If you’re looking to celebrate nano-style, check out the science theater plays Nano Dreams and Nano Nightmares and Attack of the Nanoscientist, and get costume ideas from the Intro to Nano video (according to Anders, blue makeup is surprisingly affordable). If you're going to the ASTC Annual Meeting in Fort Worth at the end of the month, please stop by to say hi! You can find us on Friday evening at the Library Bar for the Fort Worth Welcomes You! Receptions, at a breakfast we're hosting Monday morning, in the exhibit halls, during the live demo hour, or at our sessions. You can find a full list of the activities and sessions on nisenet.org, and you can RSVP here for the breakfast. Rae Ostman from the Sciencenter posted about some adaptations that they made to the Nanoparticle Stained Glass activity for NanoDays this year (click on the "comment" tab to read about their adaptations). We’re hosting a slew of Professional Development workshops and outreach events at the Materials Research Society Fall Meeting in Boston. The events include professional development workshops on honing your science presentation skills and crafting successful broader impacts plans for NSF proposals, education symposia, a University Chapters Student Mixer for undergraduate and graduate students, public hands-on demos in the Prudential Center Mall, and more. Click here for a full list of the activities. Partners attending the recent NISE Net Annual Meeting in San Francsico spent some time helping us think about new, innovative nano programming. In the picture above, attendees embodied particles forming a crystal in an activity developed by Redshift Productions (you can check out the NISE Net's liquid crystal activity here). For more information about their work email info@redshiftproductions.com. 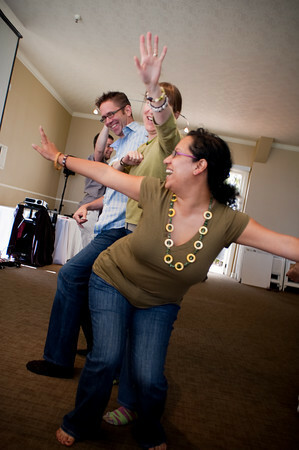 NISE Net members also prototyped a new twister-style game about scale at the Annual Meeting. We'll have it at the ASTC Conference so you can test your knowledge of macro, micro, and nano scales as well as your flexibility.